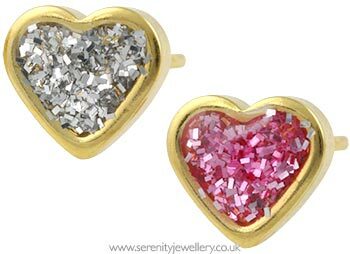 Studex Sensitive hypoallergenic 24 carat gold plated surgical steel 6.5mm wide heart stud earrings with resin covered glitter centres. These earrings come with matching butterfly backs. I was looking for a set of hypoallergenic earrings for my daughter that were completely flat on the back (due to an infected earlobe). These were perfect and have helped her ear to heal. She loves them as they are very pretty.